If you’re a CFTC program participant, your kitchen or community garden grows very well indeed! Around the world, kitchen and community gardens are making more food available to families, supporting a more diverse diet, and increasing household income. In many places, kitchen gardens mean the difference between having access to healthy food and income all year long and experiencing periods of hunger. Poverty and the impacts of climate change make it almost impossible for smallholder farmers – who produce the majority of the world’s food – to have enough food to feed themselves. 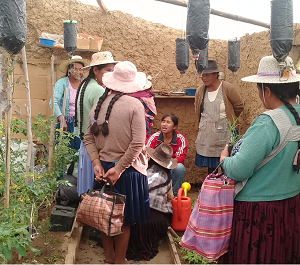 Kitchen garden training by local partner IPTK equips women to grow, sell and feed their families veggies in La Paz, Bolivia. Gardens pack a punch when it comes to alleviating hunger for families. 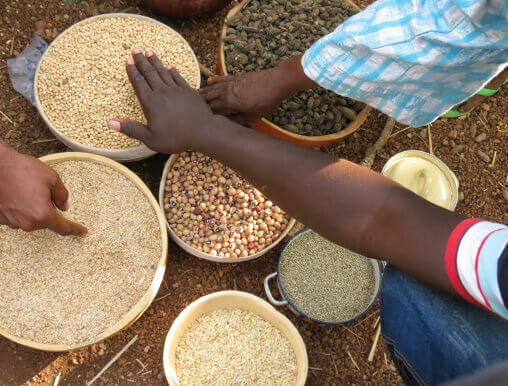 Not only are they a direct source of nutrition, but they also are a source of income that can defray food costs. With extra funds, families can invest in their farms or market activities, pay for children’s education, or put aside “rainy-day” funds for emergencies. Nutrition education so that children and families learn the basics of eating healthy. Bolivia’s urban gardens have reduced the money families need to spend to buy fresh produce and feed their children well. Among a group of 212 parents (86% women) who received training and supplies to set up their own kitchen gardens, food expenses were reduced by 15%. 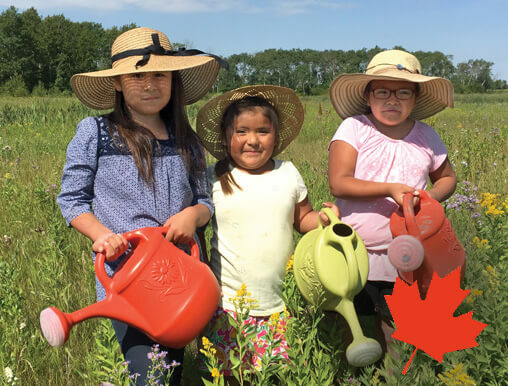 Three generations are canning what they’ve grown in their own kitchen gardens in Beardy’s & Okemasis’ Cree Nation. In Canada, where fresh produce is often scarce and expensive, community gardens have blossomed. From just five in early 2017, there are now 91 gardens in 20 communities feeding families. And, there’s even one innovative food forest, which takes gardens to a new level! 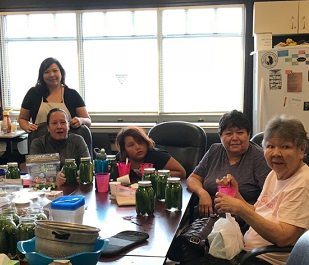 Fifty families in Beardy’s & Okemasis’ Cree Nation in northern Saskatchewan received inputs and expert support to grow household gardens and learned how to preserve and can foods. As a result, they all report greater availability of fresh fruit and veggies all year long. Gardens also improve dietary diversity in locations where a starch-based diet is common. For example, Bolivian urban gardeners have diversified their production from approximately three to more than eight types of vegetables. Kitchen and school gardeners are growing and consuming a delicious variety of greens including chard, cabbage, lettuce, celery, tomato, beet, radish, parsley and peppers. Nutrition education is an important aspect of gardening training and school food programs. 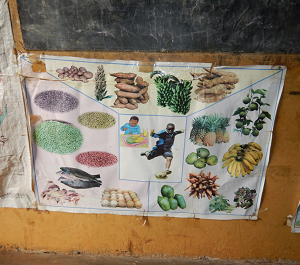 This poster in a Ugandan illustrates the link between a healthy diet and an active lifestyle. School and kitchen gardens in Uganda supplement the daily meal, typically a starchy porridge, with vegetables. Among 124 people (65% women) who have been trained in kitchen gardening and provided with seeds, 73% now add vegetables to their family’s meals at least three times a week. Nutrition education is also a vital component of agriculture and gardening training programs. 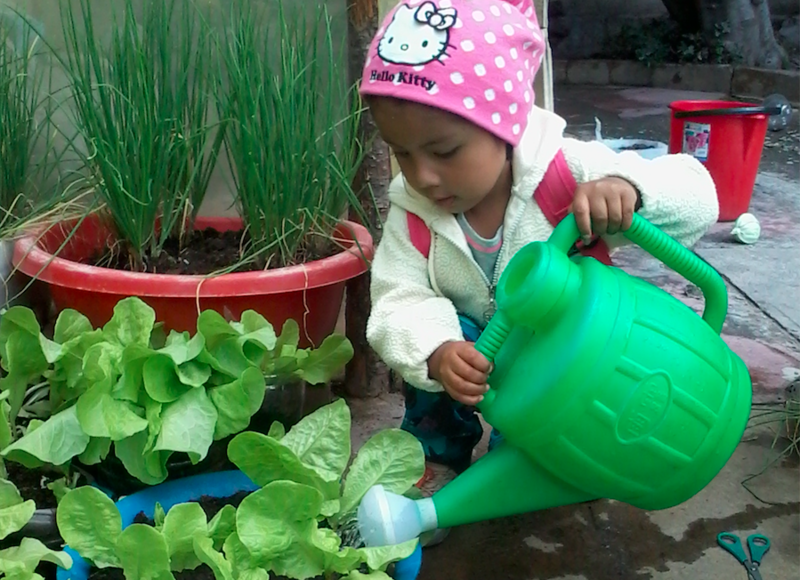 In schools and through community awareness sessions, in communities around the world, children, youth, parents and guardians are all learning the basics of healthy eating by growing their own healthy food. In many countries, women do not own land. While they work every bit as hard on small family farms, they do not control the assets produced or the income earned. 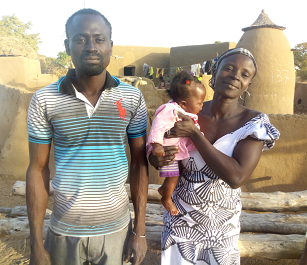 In Ghana, CFTC’s local partner ACDEP has doubled and tripled family income by training smallholder farmers in dry season gardening techniques. Drought-resistant seeds, fencing to keep animals from foraging in the vegetable patch, and basic irrigation equipment have extended the growing season. These climate-adaptive techniques have been coupled with gender training. This helps couples break down the traditional roles that constrain women’s contributions to household income and place an unfair burden of labour on women. This has led to stronger families and a significant reduction in childhood hunger.